Former Chonburi MPs Yukol Chanawatpanya and Thawatchai Anampong met with Sonthaya Kunplome on behalf of independent fishermen, who say stricter laws on boat registration and equipment have put them out of business. 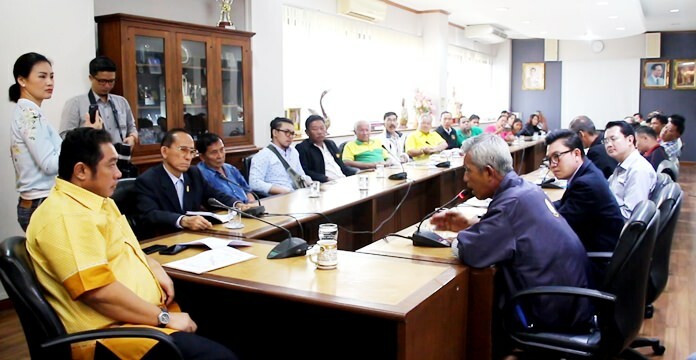 Chantaburi subsistence fishermen have appealed to Pattaya’s mayor to use his close ties to Prime Minister Prayut Chan-o-cha to get them exempted from new fishing laws enacted to protect Thailand’s seafood exports to Europe. Former Chonburi MPs Yukol Chanawatpanya and Thawatchai Anampong met Oct. 24 with Sonthaya Kunplome on behalf of the independent fishermen, who say stricter laws on boat registration and equipment have put them out of business. The three requirements they say they are most concerned with are: 1. The boat’s hull must be registered by the Marine Department, 2. Captain, helmsman, and mechanic must have licenses issued by the Marine Department, and 3. A fishery license must be applied for at the district office. The fishermen want Sonthaya to lobby the prime minister personally to get the government to pay the out-of-work fishermen compensation, exempt them from laws against environmentally dangerous fishing nets and make it easier for them to employ Southeast Asian migrants as crewmen. Sonthaya, a former MP himself, was appointed Pattaya mayor by Prayut after serving as his political advisor earlier this year and is seen as having the premier’s ear. The appeal came after a large number of small boats were impounded by the Marine Department for failure to comply with laws put into effect in 2015. Thailand took swift and strict action to bring its fishing industry up to world standards after the European Union threatened to ban all Thai seafood imports for failure to meet its laws on illegal, unreported and unregulated fishing. It took nearly three years to get Thailand off the hook, but not before many smaller fishermen went out of business. The Chantaburi fishing association says 80 percent of its members are independent subsistence fishermen who have now had their boats locked up. Some members quit the industry, others fell into debt and went bankrupt, kids dropped out of school due to families being unable to pay tuition fees, and some fishermen even committed suicide, the MPs told Sonthaya, because they either could not register their boat, get licenses for crew or meet equipment requirements. The fishermen are seeking compensation for lost wages, exempting them on prohibitions against certain nets and a restart of a “one-stop shop” program that allowed Cambodians and Burmese to easily enter the country to work on fishing boats to address a labor shortage.